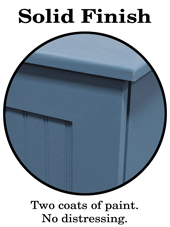 Our Wood Tilt-Out Trash Bin is still the same solid pine construction, but we're now including a larger trash can so you can toss, sort, or store even more! With our tilt-out design, the top of the trash bin stays stationary, and can be used to hold a microwave or other small appliance, serve as additional counter space, or be paired with one of our top hutches for more shelf space. The size of this piece makes it a great tilt-out trash bin for small spaces, while still holding a container that fits 13 gal. trash bags. 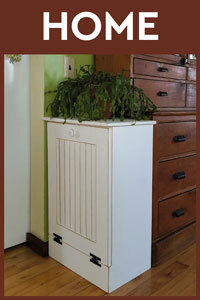 If you are looking for something a little larger, check out our #78 - Large Wood Tilt-Out Trash Bin with shelf. My husband and I just love our new Tilt-Out Trash Bin. We ordered with a solid chestnut stain and it's the perfect! The stain compliments our kitchen cabinets which are a slightly lighter shade. It's shape allows it to stand flush to the cabinets as opposed to the round, stainless trashcan that we were previously using. We have purchased from Sawdust City before and were not disappointed. Their products are always very well made!! This is exactly what I've been looking for! And so happy to see that it's made in USA with real craftsmanship. 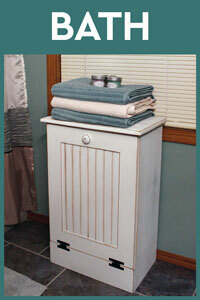 Cabinet is well built, sturdy and looks great. 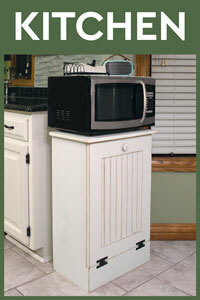 Keeps the kitchen trash can hidden plus keeps the pets from going thru it too. It fits perfectly in the existing space of my old cupboards. I got the poly and it blends in well with cupboard doors. Very pleased with this cabinet! I've searched for some time for a closed trash container and this one is perfect and by ordering directly from the manufacturer, it was cheaper than from Amazon, which is where I originally saw it. We did, however, remove the wastebasket that came with the container to use elsewhere and cut down a 13 gallon wastebasket to fit inside because we wanted to use clips on the sides to hold the liner. Works perfectly. I ordered it in the "old" white and the bead board matches the sides of the counter under which it sits. All are gorgeous, craftsmanship and painting is beautiful, the care they take in packaging and shipping second to none! No one realizes it's a trash bin, it accents any area beautifully! Overall I'm happy. My cats can not tip this over. But a couple things, mine came scratched on the top, it was packed very well so I think this happened before it was shipped. It did come with touch up paint I just wish I didn't have to use it the first day! The piece doesn't look like it was sanded at all before paint or in between coats. Also, the front door should have been caulked around the insert piece. The finish is not the best. 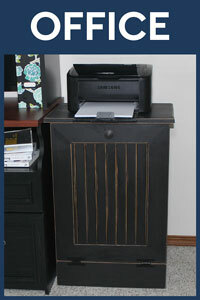 A buyer tip, the inside can is the same size as the average under desk office trash bin. Overall it works as I needed but it could have awesome with a little more care. I received the wooden trash bin a week ago. I love it and it looks great. My only change is that I wish it opened on top as well, still getting used to pulling it open on the side. I chose butternut stain from the block swatches that I received, but kinda wish I went with just poly because the stain seems a bit more yellow and dark in the larger form. Aside from those little things, I love it and would order again from Sawdust City. Best Kept Secret EVER !!! No one knows it's a trash can. We put an oval mirror above it on the wall and can put what ever decorative piece we want on the top. The design of the wood replicates the wood paneling of the doors in this small apartment. Definitely performs double duty from a functional and decorative perspective. Well-made ... love the color we chose. exactly what I wanted and hoped for!